“In my current daydreams, I muse that I will be 58 years old in 2036, at the 100th anniversary of Density 21.5. I dream that I will have commissioned and premiered the 21st-century Density by then, a work that will singularly change the definition of the instrument. What will it look like? What will it sound like? Where will the newest innovations on the flute, humankind’s oldest musical instrument, take us? Density 2036: part vi is dedicated to Doriot Anthony Dwyer. Lead support for the commissions in Density part vi is generously provided by the Cheswatyr Foundation, Alain Coblence, Hester Diamond, Larry and Arlene Dunn, Andrew and Barbara Gundlach, Tom Morris, Marguerite Pitts, Jesse Rosen, James Rosenfield, Jane M. Saks, Judith and Michael Thoyer and the Pnea Foundation Board of Directors - Amy Frawley, Laura Kirar, Rebekah Heller, Richard Frazier and Rudd Taylor. "It’s tempting to call Claire Chase—a flutist and performance artist of virtuosic abilities—an iconoclast, but her planned twenty-three-year commissioning series, intended to radically expand her instrument’s repertoire, proves that she’s far more interested in building than in breaking." Now and then an artist comes along who charts unfathomable (not to mention unattainable) territory. 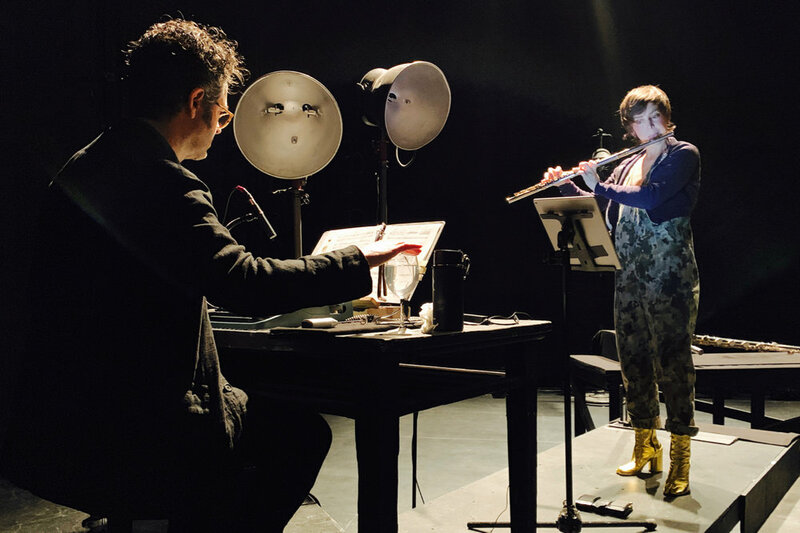 One of these is flutist Claire Chase, MacArthur “genius” grant recipient, a founder of the International Contemporary Ensemble, currently immersed in a 23-year commitment inspired by Density 21.5, the pioneering flute solo written by Edgard Varèse. Titled “Density 2036,” the project will conclude that year, marking the work’s centennial. March 1 at the Kitchen (the first night of two) showed Chase’s prowess at its blazing best: Density 2036: part vi brilliantly laced together seven works without pause to create an intriguing program of 75 minutes with no intermission. Among her collaborators, sound designer Levy Lorenzo, production designer Nicholas Houfek, and stage manager Pamela Salling shrewdly helped shape the show into what felt like a single exhalation. As the audience entered, a gossamer fog crept into the room. A horizontal bar of light, pulsing like a silent beacon, served as a transition between works, as the flutist moved around the stage—standing, sitting, and at one point performing while lying prone. Chase began Magic Flu-idity (2018) by Olga Neuwirth with percussionist Nathan Davis at a vintage typewriter—an Olivetti Lettera 22, lent by the composer. As Chase offered a wandering, Debussy-esque line, Davis struck keys in percussive counterpoint, swiped the typewriter’s carriage return, and occasionally dinged a hotel desk bell—with a cameo appearance by a battery-powered, hand-held milk foamer that Davis held near a microphone, creating a subdued whirring. A reduction of Neuwirth’s recent flute concerto, Aello – ballet mécanomorphe (2016-17), this version carried its own, stripped-down spell. Among insightful pre-concert remarks, noted electronics composer Pamela Z commented, “Speech is like an endless treasure trove.” For Louder, Warmer, Denser (2018-19), she recorded a 2018 interview with Chase, then cut it into a string of chopped-up, stuttering bits. Against this stiletto backdrop, Chase commanded not one, but three flutes, including a striking sequence in which she crawled onto a platform and nestled next to the contrabass flute. Saori Tsukada, listed as “movement advisor,” brought Chase’s abundant physicality to the fore over and over, as the artist stood, sat, crawled, and lunged, as the evening progressed. Pregnancy and hearing her baby’s heartbeat inspired Phyllis Chen to write Roots of Interior (2019). As Chase perched on a center platform, her flute timbres mingled with taped heartbeats, the latter pulsing like primeval bongos. Near the end, a digital stethoscope added the flutist’s live heartbeats to the mix. Last September, the Constellation Chor helped open the New York Philharmonic’s season in Filament, a world premiere by Ashley Fure. Composer Sarah Hennies—a percussionist—used the choir to create Reservoir 2: Intrusion (2018-19), a meditation on humanity and the physical nature of human interaction. As Chase sat cross-legged on the floor, she intoned long mantra-like phrases, while the eight singers traversed the stage around her, vocalizing, grasping hands, stroking elbows, caressing faces. Despite the apparent intimacy, an air of anxiety permeated the landscape, and it was hard not to imagine George Tooker’s iconic painting, “The Subway,” with its furtive isolation. As a short, bubbly tribute to the Varèse classic, composer Bahar Royaee (b. 1984) created Purge, incorporating fragments of repertoire from Chase’s shows—in this case, her performances of the Varèse from the last five years. In the penultimate spot came one of the high points, with percussionist Tyshawn Sorey working like a magician on a simple trap set and a small gong—which at one point flew onto the floor, thanks to his ardent ministrations. Written by Sorey (a 2017 MacArthur fellow), Bertha’s Lair (2016, rev. 2018-29) coaxed some unusual effects: by pressing one drumstick vertically on the drum head, the percussionist struck the surface with the other, altering the pitch. Later, centering a stick vertically, he squeezed it in his hand, and as he lowered his fist, the result was an oddly arresting squeak. As Chase wound down her zigzagging rhythms, Sorey matched her with his own quiet ticking, gently rapping the sticks on the drum rim. At the end of this superhuman evening, the riveting arrival of Varèse’s masterpiece as the evening’s finale seemed as fitting as reconnecting with an old friend—say, Beethoven’s Eroica. 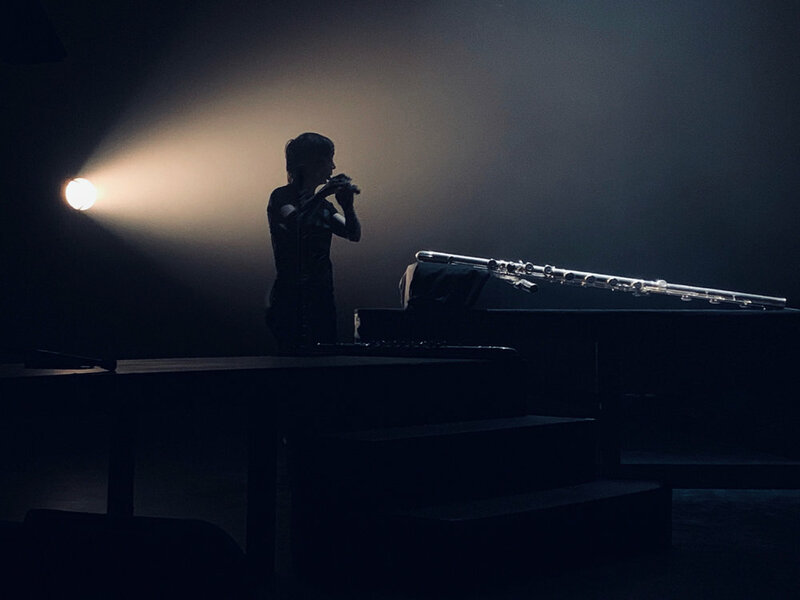 In her singular, unflinching way, Chase is not only redefining flute repertoire, but the act of playing the instrument, and the concert experience itself. It would be easy to begin by observing that the starting-point of Edgard Varèse’s Density 21.5, itself the genesis of Claire Chase’s 23-year commissioning project for solo flute, is a three-note motif. But that would be disingenuous. That ‘F-E-F sharp’ isn’t some mere lump of musical material, a mute object to slap a label on so that it can be usefully mined and manipulated by a musician, or a musicologist, or a listener, or anyone else. And the piece doesn’t just begin, either. It comes to life, and those three notes are its first stirrings. No sooner does the nascent F sound than it’s on the move: a leftward flick to the E, a quick whip back to the F sharp. This sonic wriggle is the rippling of a sinew, the twitching of a tail, the flutter of an eyelid blinking open for the first time. And with it, or rather through it, dawns something like a musical consciousness, an awareness that is of a world — the austere musical landscape into which the figure has been thrown, helpless — but also of itself, the self in the song: it sees, and it sees that it is seeing. High and dry on the F sharp, the newborn idea stretches an experimental toe downward, feeling for the C sharp below, once, twice. There, made secure by that anchoring fourth, it would be prudent to stay. But the little thought is curious. It wants to explore. And so it slides off its narrow ledge into the cloudy waters of the G natural where, shocked at the cold and at its own audacity, it finds itself suddenly afraid. The rest of the piece oscillates continually between comfort and loneliness, confidence and self-doubt, as the music seeks security, finds it, and finds itself dissatisfied. But all this activity is only possible if, as Varèse himself put it, the music first ‘pulsates with life’. And Density does. It glows with an inner heat, an élan vital, a throbbing insistence at its core without which the sounds would collapse into mere wind, mere displacement of air. Density is powered by an aortal tug-o-war. One end of the rope is manned by the tritone, the first of which is that initial hesitant, groping climb from C sharp to G. And straining at the other end of the rope is the three-note idea. Again and again, in different registers, that ‘da-da-dah’ digs in its heels, resisting the pull of the tritone, sending blood surging through the arteries of the piece, push-pull, push-pull. That stubborn little turnabout is the engine not just of Varèse’s four minutes, nor just of the last six years of Density 2036, but of the entire span of Chase’s project. Its genetic traces are everywhere in Density VI. It’s in the playful counterpoint of Olga Neuwirth’s ‘Magic Flu-idity.’ It echoes in the laugh of Pamela Z’s ‘Louder Warmer Denser.’ It courses through Phyllis Chen’s ‘Reservoirs of Interior.’ It’s remembered, or perhaps dreamed, in Sarah Hennies’ ‘Reservoir 2: Intrusion.’ And its descendants throng Tyshawn Sorey’s ‘Bertha’s Lair,’ a variation of which is performed this year not on the contrabass flute for which the piece was originally written, but on, inter alia, the platinum flute on which Varèse initially shone his spotlight. Three little notes. Three mere flickers, really, from which flow not four minutes of music, but a hundred years of it. F, E and F sharp is a far cry from the Urlinie, the three-two-one countdown to the tonic that Heinrich Schenker argued lay at the heart of every piece of Western tonal music. No tonic in Density 21.5; no major thirds either, or nearly. But like the Urlinie, this little fragment is the Keim, the germ, the nucleus from which, as for Schenker, a profusion of music grows, ‘... as man, animal and plant are figurations of the smallest seed...’ It, too, stirs with a life that is its own and, like all living things, it strives not just to exist, not just to stay alive, but to grow, to change, to thrive, and so it clambers over tritones, and leaps across decades and continents, and embeds itself in the rafters of performance spaces, and the walls of practice rooms, and the cold metal of flutes, and in the thoughts and ears and fingertips that are here, in New York City, in 2019. As the flute is a tube of metal, the Light Flute is a tube of light. This interactive light sculpture conjures a phantom flutist from a future dimension. As a live performer in this concert, the Light Flute is present with its own breath, consciousness, and awareness of Claire Chase. A limited first edition will be available for private collection in 2019. Future editions will shadow new musical commissions for the Density 2036 project. This master version is called ‘Doriot,’ after the dedicatee of this year’s Density: Doriot Anthony Dwyer, the first woman to win a principal flute position in an American symphony orchestra, and a descendent of Susan B. Anthony. Special thanks to Jorge Velez [thisisnotanumber.org]. Claire Chase commissioned Bahar Royaee, the winner of this year’s Pnea Prize for Young Composers, to create a short electronic piece to open the 2019 Density cycle, incorporating past performances of Densities from the archive of live concert recordings at The Kitchen over the last five years. In this new duo version, both the solo flute and the typewriter absorb lines of the original concerto, conjuring the spirit of Aello - at times capricious, at others demonic - with orchestral force. I had a studio visit from Claire while she was in San Francisco last summer. She brought her flutes with her so I could hear and record some of her intriguing techniques to aid and inspire my work on composing this piece for her "Density 2036" project. I also asked her if I could put her in my recording booth and interview her – telling her it would help spark ideas for the piece. I then used the recorded interview to create a text collage that became the basis of the work’s melodic and rhythmic material and its structure. What I ended up with feels, to me, like a little portrait of Claire. Her de-constructed stories, fragments of her laughter, her sighs and non-verbal sounds all conjure her for me, each time I hear them. A stretched Varèse quote also found its way into the piece, but I think of the bulk of its substance as distilled Claire Chase. There was a time when I could hear two heartbeats inside my body, beating in counterpoint, in conversation. Since the sound of my heartbeat was the first music my daughter heard, I always trusted she would intuit the rhythm of my song. With all the metaphoric uses of the heart, it is surprising that I forget to simply listen to my own beatings, its speed, its irregularities and other qualities. In this piece, I think of Claire not only as a performer but as a landscape, an environment that changes as she plays. Toward the end of the work, we catch a glimpse into her experience by way of a digital stethoscope strapped to her chest. What will her heart sound like today? And what will it be like in 2036? “Intrusion” is the second in a series of pieces called “Reservoirs” based on the relationship between human conscious and unconscious thought. The title is based on Freud and Jung’s belief that the human unconscious mind is a large reservoir of thought and feelings mostly inaccessible to us in our conscious lives. Many psychologists also believe that the unconscious mind is a “storage facility” for unpleasant and traumatic memories, a kind of internal mental protection so we don’t have to continually relive our past traumas every day. Over the past three years, as Chase and Sorey have performed the piece extensively, a series of variations on the original “Bertha” have organically evolved, each one different than the former and each one employing different flutes in Bertha’s “lair.” For this reprise at The Kitchen, Bertha makes no appearance at all, but is represented by the Varese-ian platinum flute alone. The piece was dedicated at Density iv in 2016 to the late, great Pauline Oliveros, who passed away the week before the premiere. It is in Oliveros’ forever improvising spirit that the many different iterations of “Bertha” continue to evolve. Pnea is a nonprofit, 501(c)(3) organization whose core mission is the creation of a new body of repertory for the flute in the 21st century. Central to this mission is the Density 2036 project, a 23-year initiative to commission a new program of solo flute music each year between 2013 and 2036, the anniversary of Edgard Varese’s seminal 1936 flute solo, Density 21.5. Density 2036 works are premiered each season by Claire Chase, and will comprise 24 hours of new material by the 100th anniversary of Density in 2036. In the Fall of 2019, Pnea will launch an online digital educational resource with scores, performance materials, recordings and videos of all the work created to date. By 2036, Pnea aims to make the repertory created through the project - totaling hundreds of new works in thousands of performances by flutists of all ages around the world - a significant contribution to the literature and an educational engine for future generations. Phyllis Chen is a composer, keyboardist and creative force whose music draws from her tactile exploration of objects and sound. Described by The Washington Post as “a virtuoso of the toy piano, she delights in the delicate sonorities of music boxes and everyday objects, weaving them into strikingly original works of engaging lightness and transparency. (…) Chen is a master of the art of play — serious, serious play.” She has received grants/commissions from Fromm, Pew Heritage Trust, Singapore International Festival of the Arts, Roulette-Intermedium, NYSCA, New Music USA and others. She was most recently named a 2019 Cage-Cunningham Fellow from the Baryshnikov Arts Center. Nathan Davis "writes music that deals deftly and poetically with timbre and sonority" (NY Times). His opera/ballet "Hagoromo" premiered at BAM Next Wave with ICE, and Lincoln Center presented the premiere of “Bells.” He has received commissions from Donaueschinger Musiktage, GMEM, Claire Chase, Steven Schick, Miller Theatre, the Calder Quartet, Third Coast Percussion, and Yarn/Wire, with premieres at Tanglewood, Park Avenue Armory, and Carnegie Hall. The 2018 Aaron Copland Fellow at the Bogliasco Foundation, Davis received awards from the Camargo, PEW, Fromm, and Jerome Foundations, MATA, and ASCAP. An active percussionist and member of ICE, he appeared as a concerto soloist with the Seattle Symphony, Tokyo Symphony, and Nagoya Philharmonic. Davis teaches composition at Montclair State University. Sarah Hennies is a composer/performer based in Ithaca, NY whose work is concerned with a variety of musical, sociopolitical, and psychological issues including queer & trans identity, love, intimacy, and psychoacoustics. She presents her work internationally and has received commissions for new music by a variety of ensembles and institutions. Regular collaborations include Meridian (with Tim Feeney & Greg Stuart), a duo with sound & performance artist Jason Zeh, and the Queer Percussion Research Group (with Jerry Pergolesi, Bill Solomon, & Jennifer Torrence). She is the recipient of a 2019 Foundation for Contemporary Arts Grants to Artists Award and a 2016 fellowship in music/sound from the New York Foundation for the Arts. Nicholas Houfek is a NYC based Lighting Designer working in Music, Dance, and Theater. His work in Music and Theater include: Patti Smith (Tribeca Film Festival/Beacon Theater,) International Contemporary Ensemble, Maya Beiser, Ojai Music Festival, Silk Road Ensemble, Family Play (Collaboration Town/The New Ohio),The Capables, (Gym at Judson), The Highwayman (ARSNOVA, Dickson Place) and The 39 Steps (Olney Theatre Center). Mr. Houfek has toured with Parsons Dance Company, Límon, Martha Graham Dance Company, and Jonah Bokaer as Lighting Supervisor. Co-Lighting Designs include: Li’l Buck and YoYo Ma at (le) Poisson Rouge, and Natalie Merchant Tours. Jenny Judge is a writer and musician. She holds a PhD in musicology from the University of Cambridge, as well as degrees in philosophy, mathematics and music from University College Cork and the Cork School of Music. She is currently completing a second doctoral dissertation at NYU, this time in philosophy, which explores the resonances between musical experience and the philosophy of mind. Judge writes and performs original music as part of Pet Beast, a collaboration with jazz guitarist Ted Morcaldi. In addition to the academic press, Judge writes for publications such as Aeon, Medium and The Guardian. She also writes fiction. Born in Bucharest, Filipino-American Levy Marcel Ingles Lorenzo, Jr. works at the intersection of music, art, and technology. On an international scale, his body of work spans electronics design, sound engineering, instrument invention, installation art, free improvisation, and classical percussion. Recent work explores the connection between sound and light. Lorenzo’s work has been featured by the International Contemporary Ensemble, MoMA PS1, MIT Media Lab, STEIM (NL), pitchfork.com, slashdot.org, Philips, Bose, BBC, Burning Man, and The New York Times which named him an “electronics wizard”. Visit the artist’s portfolio at levylorenzo.com for featured performances and new inventions. Olga Neuwirth was born in Graz, Austria, in 1968. She studied at the Academy of Music in Vienna and the San Francisco Conservatory of Music. During her stay in the States she also attended an art college, where she studied painting and film. She first burst onto the international scene in 1991, at the age of 22, when two of her mini-operas were performed at the Wiener Festwochen. Ever since her works have been presented worldwide. With Nobel Prize winning novelist Elfriede Jelinek she has created two radio plays and three operas. Her opera Lost Highway, based on the film by David Lynch, premiered in 2003 and won a South Bank Show Award for the production presented by English National Opera at the Young Vic in 2008. Beside several concerts for her 50th anniversary in 2018, Lost Highway and The Outcast can be seen in new productions. Lost Highway under the direction of Yuval Sharon and The Outcast under Netia Jones. Her new opera Orlando will be premiered at the Wiener Staatsoper in 2019. Born and raised in Iran, Bahar Royaee is a composer of concert and incidental music. Her compositions are a mixture of timbral and sound-based atmospheric structures, interspersed with lyrical influences derived from her Iranian background. Her works have been performed worldwide, including Italy, Greece, Germany, Canada, Iran, and the USA. Bahar was recently recognized as a runner-up in National Sawdust's 2018-19 Hildegard Competition. Other awards include the Roger Sessions Memorial Composition Award, Walter W. Harp Music & Society Award, John Bavicchi Memorial Prize, and the Korourian Electroacoustic Award. Bahar received her M.M. in composition from Boston Conservatory, where she studied with Marti Epstein and Felipe Lara, and is currently pursuing a Ph.D. from CUNY where she studies under Jason Eckardt and Suzanne Farrin. Newark-born multi-instrumentalist and composer Tyshawn Sorey is celebrated for his incomparable virtuosity and an extraordinary ability to blend composition and improvisation in his work. He has performed nationally and internationally with his own ensembles, as well as with numerous luminaries from a wide variety of musical backgrounds. Sorey's latest recording project, Pillars, has been praised by Rolling Stone as "an immersive soundworld… sprawling, mysterious… thrilling" and has been named as one of BBC Radio 3’s Late Junction 2018 albums of the year. Sorey was awarded a MacArthur fellowship in 2017 and holds the position of Assistant Professor of Composition and Creative Music at Wesleyan University.